Acting legend Donald Sutherland received his Hollywood Walk of Fame star on Wednesday; it’s right next to the star in honor of his son Kiefer Sutherland, outside of the Roosevelt Hotel. Sutherland told the crowd he’s happy to be alive so he can enjoy his star. Not in attendance at the unveiling was Kiefer Sutherland, who is currently in New York. A message he wrote was read aloud by Colin Farrell, Donald’s co-star in the comedy “Horrible Bosses,” due out at the end of this year. “I selfishly wanted to be there to simply tell you how proud I am to have you as my father and how even more proud I am to be your son,” Kiefer Sutherland wrote. 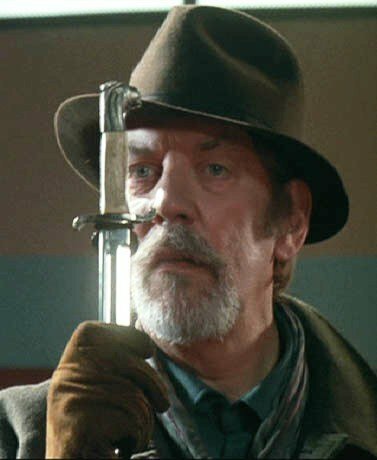 Donald Sutherland’s acting career has spanned five decades, and if he has his way, it won’t end anytime soon. And we can’t forget his role of Merrick Jamison-Smythe in “Buffy The Vampire Slayer”! 50 queries in 0.639 seconds.